This is based on an intriguing, delicious Greek dish that Hugh found in a battered old copy of Mediterranean Vegetable Cookery by Rena Salaman. 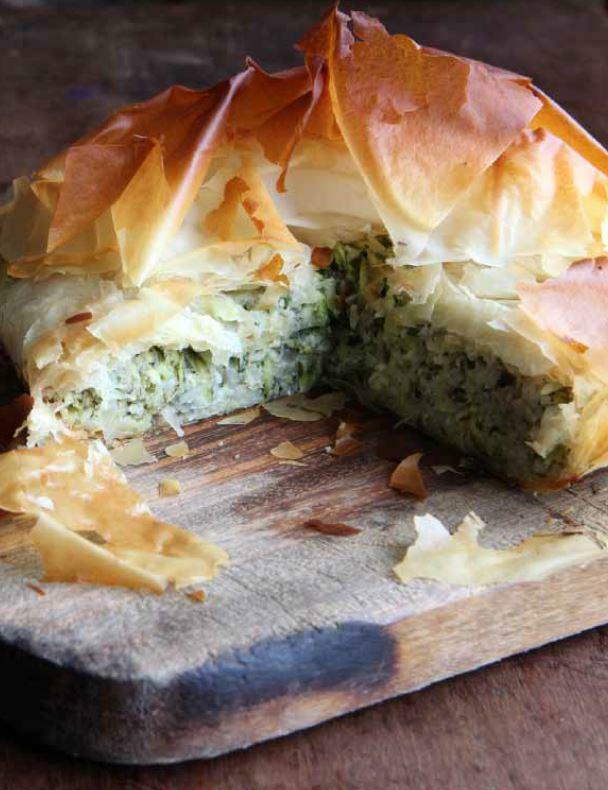 The rice steals the water from the grated courgettes and plumps up as the two cook together inside the pie. It’s as tasty as it is cunning. Preheat the oven to 190°C/Gas Mark 5. Mix the courgettes, rice, onion, cheese, eggs, olive oil and chopped herbs together in a large bowl. Season with plenty of salt and pepper. Take a sheet of filo pastry, brush with a little melted butter and use it to line a smallish ovenproof dish, about 1.5 litre capacity, placing the pastry butter side down. Let any excess hang over at the ends. Add another buttered sheet on top and continue until you’ve used all but one sheet of the pastry. Tip the filling into the pastry-lined dish. Fold over the pastry ends to enclose the filling, dabbing with a little more melted butter to keep the pastry together. Take the remaining sheet of pastry, crumple it lightly in your hands to give a nicely textured finish and place on top of the pie, tucking in the edges around the side. Dab a little more butter over the surface and bake for 45 minutes until golden. Serve hot or warm.